I am in charge of inventory and supply. What features should I look for in shoulder joint models for a teaching and training focused hospital? In any type of hospital or health care facility where training and ongoing professional development is a goal, high quality shoulder joint models are a great idea. They should also be combined with all other types of human anatomy models to provide a wide range of learning tools. The key to finding the most comprehensive types of human anatomy models is to look for a company that has a good reputation and years of experience. Companies that have supplied pharmaceutical companies, doctors, health care facilities, clinics and schools of medicine are a great place to start. In addition models that include all the necessary features without crowding the model with labels and extraneous components are the best option. This allows the models to be a good option for working with staff as well as quick, simple and clear patient consultations. Look for shoulder joint models that are designed to be durable, practical and realistic. These three features will ensure that the model is used frequently and becomes a part of how the staff interacts with patients and even with each other. Are there any shoulder joint models that provide clear identification of all the parts of the shoulder? There are different shoulder joint models with more or less detail depending on the type of model you require. Both options, the muscled or basic models, do have identification cards that are mounted to the back of the stand. These cards measure approximately the same size as the model and are a duplicate of the model in a smaller graphic representation. Each part of the model is labeled on the card with simple lines clarifying the various structures. The benefit of this type of model is that both the model and the card can be used to interact with patients, talk to clients or to share information between medical staff. The level of identification needs to be comprehensive on the card to cover any possible patient or teaching discussion that may occur. 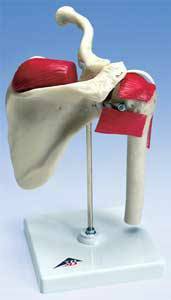 Can I use shoulder joint models in combination with other types of teaching aids in my advanced anatomy classroom? Models, including shoulder joint models, have a definite advantage over many of the more traditional types of teaching methods. Even in advanced level classes most students learn from reading text books or studying photographs or anatomical charts. While these teaching aids are helpful, combining them with time to study and examine a life sized shoulder model can reinforce all other types of learning. For highly visual learners that like the hands on approach models are an excellent way to study a body part from all directions, really increasing full understanding. Models can also be combined with new types of technology such as 3d human anatomy software. The model can provide the physical presence while the online simulation or model can be used to supplement or compliment the learning process.